Have a go at the RSPB’s specially created Egg Trail quiz and collect your reward. Lord Thomas is six years old and his pet dragon has escaped. It has laid eggs around Gwrych Castle and he now needs help finding them. If you can find all of the eggs, there is a surprise waiting in the formal gardens. 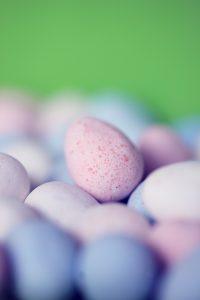 Cadburys have sponsored the National Trust with chocolate eggs this year and so there are lots of Easter Egg Hunts being run in the North Wales National Trust Properties. A couple of our favourite local ones are at Penrhyn Castle near Bangor where you have to solve riddles to find the eggs or going one step further, Conwy Castle has dragon eggs to find using your smart phone…. pokemon eat your heart out! Meet Ffion the dragon for the first time this Easter, the brand new (super friendly) mascot for Zip World! You can enjoy the Easter holidays at Zip World with plenty of puzzles, delicious themed food to get stuckdragon-shapeding dragon shaped shortbread! And don’t forget to join in with the Easter egg hunt to win a chocolate treat, as well as enjoying the fabulous Zip World attractions. This is a great place to visit with children as there are lots of activities to do including karting, wake-boarding, archery, bowling, SUP, clay pigeon shooting etc all at very reasonable prices. There is a cafe at the park or if you bring your own food, plenty of picnic benches to use. As Easter is early this year, we might not be ready for beach days just yet so this will be a great day out as an alternative. Again, while we wait for the weather to warm up for those beach days, Coed Y Brenin is a must. Mountain bike, running and walking trails are all available here and some of the best in the country. They are running a number of workshops for children during the Easter holidays, including art and nature walks alongside the trails that are open daily. Greenwood Forest Park has lots on offer for the younger ages. Based just outside Caernarfon, they have a full calendar of events taking place every day including an Easter egg hunt, theatre performances, craft workshops, hair braiding; this is all in addition to the rides and activities there are already there. As you can see there are lots of Easter activities in the North Wales region, why not book a short break or if you have ever considered holiday home ownership book a park tour and spend a day as an owner on one of our beautiful parks.